ABC is not saying the show was cancelled, but they have a habit of pulling shows and not making an official announcement. To be fair, the show does have anemic ratings. Maybe it’s the name. Maybe it’s the rotating time slots. Maybe it’s James Van Der Beek. Who knows? Actually, maybe it’s the kind of show that doesn’t attract a very large live viewing audience. It shares a similarity with shows like Cougar Town, Community, Happy Endings – none of which are ratings blockbusters, but share a wit that attracts a younger, more internet-savvy audience. I am not sure if I have ever seen any of those shows in their regular time slots. And I bet I am not the only one. In fact, I would venture to say that all of those comedies would do better if they were not on network television. Cougar Town is testing that on TBS right now. We’ll see. 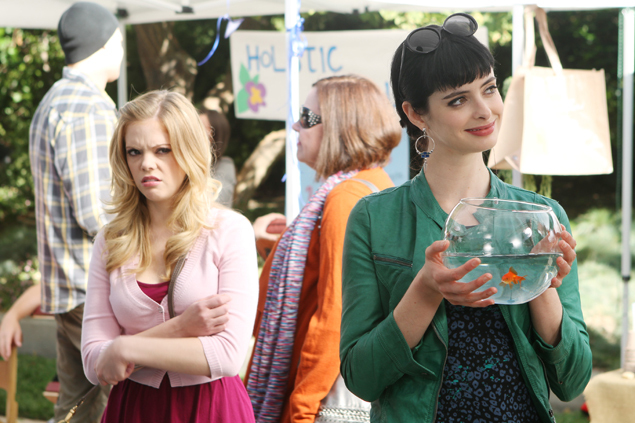 In the meantime, if you haven’t been watching Dreama Walker and Krysten Ritter‘s hilarious comedy, check it out online. It’s well worth the laugh.